The wireless video camera uses the computer’s hard disc drive to store recordings to be viewed at a later time. You can adjust the amount of space that your camera would use in storing videos in the hard disc. This article will guide you in adjusting the amount of space your camera would use for its videos. On the Viewing Area, click the Setup button. 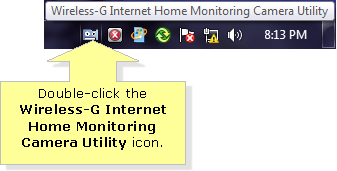 In the Setup window, click Preferences. 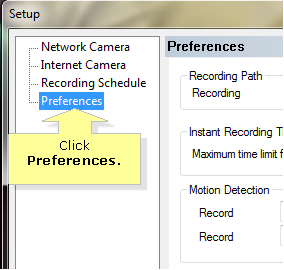 Under Disk Allocation for Each Camera Recording, enter the Maximum allowed space per camera that you have allocated for your camera’s videos. NOTE: The value for Maximum allowed space per camera is in Megabytes (MB). In this example, the value used is 1000MB. Click Save then click Exit.